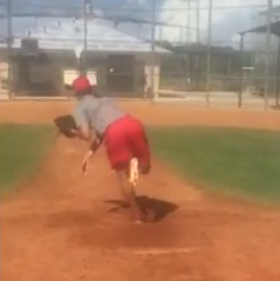 I am trying to get my son to not spin out to the left and towards home plate after he plants his lift leg. I was wondering if I should leave it be or have him plant on a 45 degree angle and maybe he will spin to 90 degrees and move towards the plate. I have a link here full speed and slow motion. Your input is appreciated. That is the advice we needed. We have been practicing mechanical pitching reps everyday and now I will put the bucket there and try to get his leg to look like the photo you attached. At release point, his posture is out of whack with his head and spine tilted to the glove side. His glove side is also out of whack with his glove well outside (to the left) of his torso. Before these things happen, he strides towards the throwing arm side while his center of mass actually appears to move towards home plate. If accurate, this could be setting up the posture issue. It’s difficult to tell from the camera angle but he also appears to come set with his feet too wide apart requiring a weight shift towards 2B to go into knee lift. I can’t really make out where the rubber is but the first thing I’d do is move him to the glove end of the rubber to minimize the effect of the stride direction. I’d also have him narrow his stance in his set position. Then see what effect this has on the remaining issues. 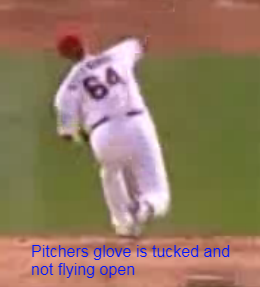 If there are still spin-out issues, have him keep his head upright and stabilize his glove in front of his torso. Just wanted to share the last pitch from today’s bullpen. Full motion and slow motion. I think it is a big improvement and he seems to be going in the right direction. Thing I’m noticing is the back foot. Seems like he’s dragging it away from the rubber prior to landing. I see that now that you pointed it out. He has made so much progress in just one week I will let him try to get these latest movements instilled before I point that out to him. Do you think he should stride 6 inches less to compensate? How would you approach fixing that from here? Don’t know that I’d approach as trying to shorten the stride although the end result could shorten. I believe it’s an issue of stabilizing his foot & timing. I’ll defer to more knowledge on the site for specifics. Hopefully Steve & Roger will check back in. They will be much more helpful than I on making recommendations. He lands 8 inches to the wrong side (ball arm side) of the field driveline (the imaginary ground line running between Home plate and second base, thru the pitchers plate), this cuts off efficient body rotation. This added to his back bend and backside corresponding leg lift recovery throws his center of mass to the opposite side to recover. Your legs work better if they stay in their lanes. Looks noticeably better to me. I don’t see any issues with the back foot drag. 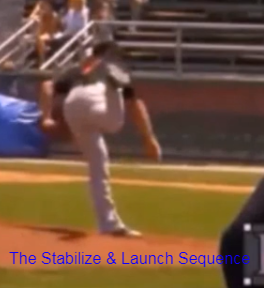 I do, however, still see a small weight shift towards 2B at the start of knee lift. If I’m a base runner on 1B with a steal sign, I’m taking off as soon as I see that weight shift. Once his front foot lifts off the ground, he should only move forward. Explosive Early Momentum without compromising his delivery. F. Back foot firmly planted on ground. Using entire back foot to drive force into the ground into the delivery. We just got back from our USA tournament last week. My son pitched well but as you can see he is different in games then he is in practice. His fastball had good velocity and he displayed a plus 12/6 curveball. 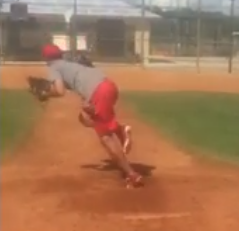 I am trying to figure out why his starts leaning towards first base when he comes out of his leg lift. I am thinking he plant foot is landing slightly open or his back foot is lifting off the ground to soon. I enclosed some full motion and slow motion videos from the game. Thanks to all of you for your help the last two years. My son has become a good pitcher and still shows a lot more promise. I look forward to continue helping him get better and posting on lets talk pitching. Hope all is well. Sorry I couldn’t get back to you sooner but I got very busy here. A couple questions first. Is Evan throwing too high? Too low? Control problems? If he doesn’t exhibit any of these, then I would say this is his delivery. I am sure some will say he falls of to the side of the mound after his delivery, which he does. But you have to ask yourself, maybe he doesn’t have a problem at all. 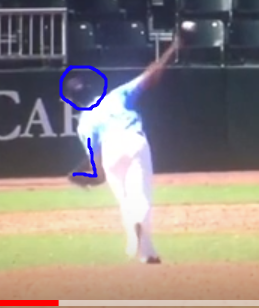 Maybe his mechanics are more rotational than what coaches or you are use to seeing. –Hit the spot drill: simple drill while playing catch or throwing bullpens. Partner holds the glove (target) as the pitcher work’s on focusing on this target with his eyes and hitting the target every time. Drill is about 60 feet away. Have him also start tucking his glove but please don’t compromise his rotation.